M(i)s Ch(i)ef™: The Outtakes 2011! Of course I think of myself as pretty good at cooking - enough to blow my own trumpet about something amazing that I have prepared or eaten on a weekly basis. However, I am not infallible and there have been some shockers that don't make it to the pages of M(i)sCh(i)ef! Normally they are blocked from my memory, but here are a few I choose to remember and share for a giggle as I reflect on my year of cooking and blogging! Gnocchi - Pre freezer disaster! 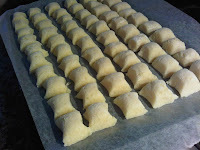 Gnocchi - after making a huge batch of gnocchi on my first attempt, I read that it was good for freezing and you could even cook it from frozen. I must have added just a few too many to the boiling water, so that by the time they were cooked, all the gnocchi had disintegrated into a gooey mess. Profiteroles - away for the weekend, I thought that profiteroles would be a quick easy dessert. I am pretty confident with my choux pastry, but with out kitchen scales, I had to wing the quantities adding a bit of flour here and there to get the right consistency of batter. Unfortunately, that's not exactly how choux pastry is made so they didn't puff up, but were flat biscuit-like rings! Next time I've promised my friends proper profiteroles, so I'd better live up to that when I have my trust scales! Ice cream - sometimes I can get quite impatient in the kitchen, and a little cocky! I made custard for ice cream the other day and was too impatient to follow the recipe thinking I knew better and ended up with scrambled eggs! 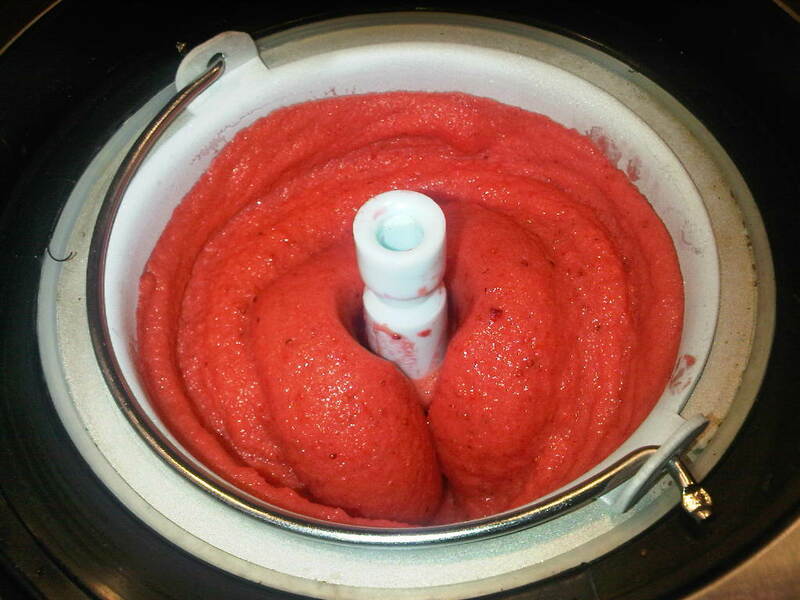 I ended up making strawberry sorbet instead! Crab omelette - after a long day of work, working out etc. I sometimes feel a bit exahusted. Last week I thought I'd make a quick Asian omelette. Just as well I checked the recipe a few times only to realise that I had mistaken tablespoons for teaspoons and put in quite a lot more soy sauce than I was meant making a horrible brown coloured egg mixture! Kahlua Truffles - Making my work colleagues a Christmas gift was supposed to be easy - a recipe I've done over and over since I was little - I thought I'd go fancy and get Lindt 70% Cacao Chocolate to be extra special, only to find that the higher the percentage, the more liquid is required to prevent it from seizing. The mixture ended up like a yucky sludge! My successful attempt used only 40% chocolate. So tonight, I'll be raising a glass to toast the successes (and failures) of 2011! Here's to a fab 2012! What a wonderful idea. That makes me feel a lot better about my 'hiccups.' I'm going to save this year's failure pics. Loved your celebration of your cooking mishaps, Michelle! I often think we learn more from our mistakes than our successes and when we finally get it right, success is all the sweeter. Here's to lots more glorious kitchen disasters in 2012!